Earlier this month I featured some comments about a fabulous lunch I had with friends at Christopher’s restaurant following a viewing of the new movie “Julie and Julia”. I mentioned then that the chef/owner Christopher Gross was featuring a special Julia Child dinner during the month of August to honor the grand lady and the release of the movie about her life and the young woman, Julie Powell who was inspired by her. Well, you might say that I and my friends were inspired to try this special meal. So today I’m showing you a photograph of the impressive dessert the followed a very rich and beautiful meal. The dessert is called Parnassienne of Chocolate Mousse Tower with Fresh Berries. Mmmmmm….delicious! The Arizona economy is based on five industries and every school child in Arizona learns about the five C’s that provide income for the state. Those are Copper, Cotton, Cattle, Citrus, and Climate. Today I’ve posted a photo of a cotton plant with its bloom or “boll” wide open and ready to be harvested. Arizona is known for Supima cotton, a variety that is widely considered the finest cotton in the world. The name comes from Superior Pima after the Pima Indians who helped the U.S. Department of Agriculture develop it in the early 1900’s. Today, the Supima fiber quality is very well regulated. Clothing makers like LL Bean and Land’s End pay $5000.00 a year to use the Supima name on their labels and the pieces of clothing with those labels are routinely tested and the DNA mapped to make sure the cotton in pure Supima. Even Ralph Lauren uses Supima cotton to make his famously fashionable sheets because the infamous Egyptian cotton does not have the same quality control standards. All of that planning and commerce around that tiny little cotton ball not much bigger than the cotton balls we all use to apply make-up or wash a wound. In the courtyard of the Concord Plaza building is a decorative pond stocked with fish. The day I was there, these fish appeared to be sunning themselves because the were sitting perfectly still just under the water. I recently had the opportunity to step inside an office building called Concord Plaza. I was surprised by this grand staircase in the lobby of the building. I certainly didn’t expect all that beautiful wood. Behind the staircase was this wonder mural-like painting of the Grand Canyon. It takes a lot of water to keep a lush golf course located in the middle of the desert green. On my way to the Friday morning meeting at The Boulders Resort, I got a glimpse of the powerful water sprinklers that help to keep it green. The Boulders Resort is a wildlife sanctuary with many animals and birds in abundance. I saw hundreds of these furry little desert cottontails hopping about the area. I love the way the rising sun has lit up his ears. In addition to the javelina I featured on Saturday, I also saw a large number of quail, some type of ground squirrel, and early Friday morning, a coyote slinking around the edge of the golf course. A bellman who picked me up in one of the many electric carts used to transport visitors said that there are also quite a few bobcats roaming the property and climbing the rocks. Just outside my room at The Boulders Resort was a very large prickly pear cactus loaded with fruit. The fruit is edible and when properly cleaned and peeled, is used to make candy, jelly, and juice. I think the abundance of wildlife on the grounds of the resort enjoy the prickly pear fruit. I caught this little fellow nibbling on a red beauty for breakfast. The Boulders Resort is located in an area north of Phoenix and Scottsdale that is dominated by unique granite formations that are millions of years old. The rooms or “casitas” of the resort are all built to meld into the natural surroundings of this rugged desert setting. In today’s photo, you see a slice of the golf course bordered by some of the remarkable granite formations. Early Friday morning, I took a walk around the property and watched the sun rise over the golf course and light up the boulders. The small photo shows a scene very near my casita just before the sun crept over the horizon. First, let me apologize for the quality of this picture, but I couldn’t resist posting this photo of a real javelina after yesterday’s art subject. The fact is, I just saw this little guy Thursday night on my way to dinner. Let me explain. Thursday I arrived at The Boulder’s Resort in Carefree Arizona, a small community just north of Scottsdale to attend a work related meeting. I was on my way to dinner that evening when we spotted a group of javelina grazing on the edge of the golf course. All I had with me at the time was my little point and shoot camera and I’m afraid that in the low light, it was having a hard time determining where to focus. Too top that off, I was really excited to see my first javelina in the wild! The Boulder’s Resort is an amazing place. I’ll post a few more photos from my stay there over the next few days. I took this photo last winter while on a home tour that was a fund-raising event for a local organization. At the time I had no idea who the artist was. I just liked the look of this little javelina like animal. Recently I purchase a book about art in the Phoenix area and found a picture of more of these little creatures. I learned that the artist is Theodore Troxel, a local artist who creates things from found objects or throw-away stuff. He mostly creates animal shapes or small utilitarian objects. 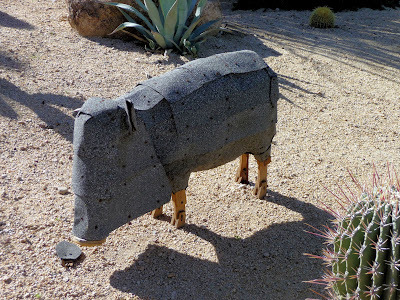 These little indigenous creatures are made from materials left at construction sites. This little fellow is made from pieces of wood and left over roofing materials. It struck me that this art is somehow apropos of the stalled housing industry we are currently experiencing in this part of the country. 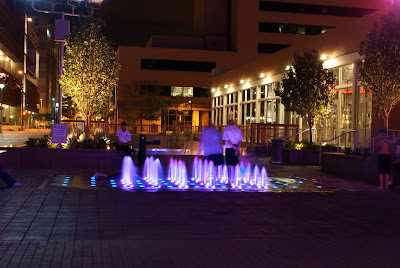 The fountain in front of the Phoenix Art Museum is unique in style but produces the same lovely, calming, water-sound that make fountains so popular. The small photo shows a little more of the fountain with the entrance to the museum behind it. Today’s photo isn’t about food, but it was food that brought me to the site of this gorgeous bronze statue. I had a fabulous dinner with friends last Saturday evening at a new steakhouse located in the renovated Camelback Inn and Resort. The restaurant was BLT and if you are a local reader, I highly recommend it. The steak was superb and the service was, in a word, brilliant. 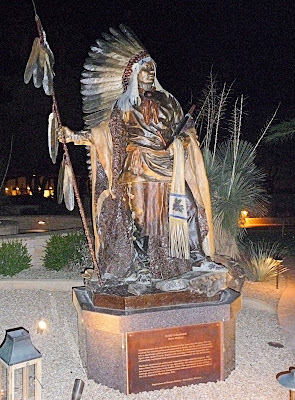 This lovely bronze statue stands at the entrance to the Camelback Inn and from the inscription, I learned that it was created by renowned artist and sculptor Dave McGary. This statue is the 4th casting of a statue that was commissioned by a committee that included members of the Washakie family. One of the three original castings is in the permanent collection of the Statuary Hall in the U.S. Capitol. Chief Washakie was chief of the Shashones for more than 60 years who was a skilled orator who spoke French, English and a number of Indian languages. Upon his death at the age of 102, he was given a full military funeral, the only one known to be given to an Indian Chief. I recognized the name of Dave McGary as an artist that my sister brought to my attention after she visited his studio in New Mexico. I talked her into posting a photo from there, so stop by her site at Prescott Area Daily Photo to see another amazing piece of art from this very talented artist. My title today does not refer to the high school prom queen or the George Clooney’s of the world. It refers to this regal date palm that I spotted in one of the historic neighborhoods near where I live. Did you know that dates are thought to be the oldest food producing plant? The Sumerians were cultivating the date palm in 5000BC. There are hundreds of varieties of dates all with different names and I have no idea which variety is pictured here. I did however learn that the date palm is native to the area now known as Iraq and today Iraq still produces 80% of the world’s dates. The plants like hot and dry climates but they do require water. That’s why they are romantically associated with oases. They grow in places that have some type of water source. Yesterday I went to see the new movie “Julie and Julia” based on the best selling book by Julie Powell. I thoroughly enjoyed the movie and highly recommend it. If you are a “foodie” as I am, then the movie is a must see. You might be asking what does the movie have to do with today’s photo and the title of Christopher’s. Well, after an early matinee of the movie, my friends and I were in the mood for French food and we were ticking off the names of French restaurants in search of one that would be open for lunch on a Sunday afternoon. Christopher’s immediately jumped to the top of the list because it was close by and we knew it would be open because of its location within the Biltmore Shopping Center. I have eaten at Christopher’s many times both in this new location and in the previous spot at the other end of the shopping center. The food is always exceptional and you can be assured of finding an equally exceptional wine to accompany it. And, yesterday’s meal was true to form. Our food and wine were superb and it was the perfect meal after such a gastronomically inspiring and delightfully entertaining movie. We discovered that our choice was absolutely perfect when our waiter informed us that the restaurant's owner/chef, Christopher Gross has cooked with Julia Child and appears in one of the episodes of her PBS television series called “In the Kitchen with Master Chefs”. How is that for a perfect coincidence? The restaurant is doing a special Julia Child dinner during the month of August. I think I’ll be back for that special event. Oh yes…about today’s photos. Christopher’s is another restaurant with an open kitchen and plenty of seating around the area where all the action takes place. The small photo looks into the dining room. True Food is a restaurant that has been open for about a year at the Biltmore Fashion Shopping Center. The concept for the restaurant is healthy food made delicious. It was created by Dr. Andrew Weil in partnership with Fox Restaurant Concepts. The dining room is a large open space with the kitchen and food preparation on one side and the tables on the other. I took the photo above while seated at my table and looking toward the kitchen. That young man standing in the center is making ravioli at the prep table. That was fun to watch. My favorite thing on the menu is the Sashimi Tuna Salad that features avocado, tomato, and edamame, along with the raw tuna and greens. They use local and regional organic produce as well as wild or sustainably harvested seafood. All of the pastas are wheat free. They even serve biodynamic and organic wine. It has turned out to be a popular place. There is always a line waiting for tables. If you wanted to be a policeman or fireman ever since you were just a tot, this is the place for you. A high school dedicated to future police officers and future firemen. This school is the first of its kind in the nation offering a rigorous academic education as well as a head start into a career in public safety. The school works directly with the city of Phoenix to provide real-world experience and hands-on opportunities such as internships, physical training, and special employment opportunities. To see what some other Arizona bloggers have shown us for the “Back to School” theme, click the links below. Here is an unusual cactus that has leaves as well as thorns. Some people around here call it a Madagascar Palm Cactus and others call it a Good Luck Cactus. If Google has served me well, its official name is Euphorbia Trigona. Those are fresh herbs and a few vegetables growing in that planter that runs along the wall. If the wind is blowing, you can smell the basil as you walk by. They have some pretty fantastic pizza and you are looking at one that has become a favorite of mine. It’s the Spicy Barbecue Chicken pizza and it’s delicious. Mmmm….I could eat one right now. Across from the “Love” sculpture that I featured yesterday is a fantastic water feature that sort of snakes its way through the park area. I loved the way it was framed by rows of flowers. I also liked the way the water was churning up out of the holes in the fountain. I spotted this tiny little fairy hovering around the “Love” sculpture at the Scottsdale Civic Center park. With wand in hand, she’s about to bring a smile to the face of that gentleman sitting inside the sculpture. I was in Scottsdale on Saturday to visit the Scottsdale Museum for Contemporary Art (SMOCA for short). It was the last weekend for an exhibit titled “At the Crossroads of American Photography: Callahan, Siskind, Sommer”. The three photographers, Harry Callahan, Aaron Siskind, and Frederick Sommer are credited with helping to define photography as an art form. One of the photographers, Frederick Sommer lived and worked in Prescott Arizona. The photos were mostly from the 1940’s and 50’s and they were wonderful works of art. I was inspired. I passed here just in time to capture the last standing wall as it was being torn down. This pile of rubble is the old Bekins Storage Building that faced Central Avenue for many, many years. You can't tell from these pictures, but the building was at least 6 stories tall. They were using two big hoses spraying water in an effort to keep the dust down. It wasn’t working very well. You could see the dust cloud a half mile down the road. It will be interesting to see what happens to this space after the rubble is cleared away. It’s not only the kids who like to play in the water! So much champagne…..so little time…..
Last Friday I featured a bright red hibiscus blossom. For this Friday, I located a yellow one. Have a great weekend everyone. This building has been empty for the past year and I can’t recall what type of business might have been here at one time. The building is striking in a “Las Vegas” kind of way. It looks like it should house some type of spa, but the limited parking space might be a deterrent. 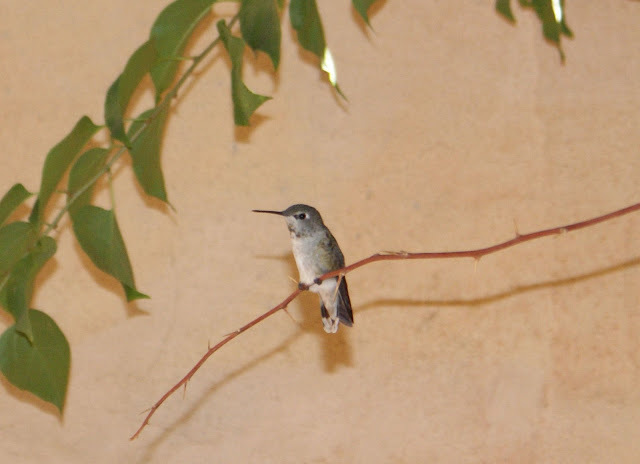 It’s not often that I get an opportunity to see a hummingbird resting, especially at close range. This little fellow let me get amazingly close while I snapped a few pictures before he swiftly hummed off in search of more nectar. I have been fascinated by these Bismark Palms that surround a restaurant on Camelback Road. They are strikingly different than the majority of palm trees around the city. So, one day a few weeks ago I stopped to photograph these trees, however the photos just didn’t have the same appeal. After many trips past this same location I suddenly realized that it was the combination of the unique palm and the unique roof design of the building that really caught my eye. So, I went back last Saturday and took more photos. It’s probably just me and my love of geometric lines, but I think this shot is much more interesting than the tree all by itself. 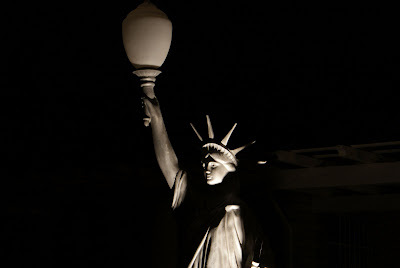 While I was out doing some night photography I decided to stop and take a photo of this large Statue of Liberty that has been in the front yard of a home along 7th Avenue for many years. It’s silver color and a low light exposure makes it look ghostly. 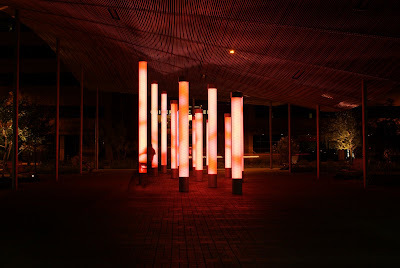 I featured a photo of these amazing light pillars that are part of The Civic Space Park in downtown Phoenix back in May. When I was recently there with the tripod and camera, I photographed them again this time using different exposure lengths. While I was there, a cyclist started weaving through the tubes and I was able to capture his ghost-like image on this photo. 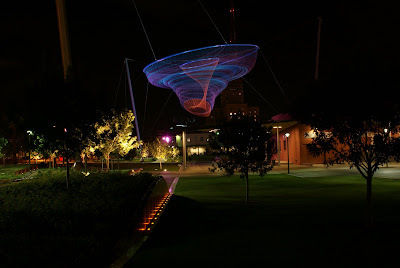 On May 11th, I introduced my followers to "Her Secret Is Patience", a major art piece by artist Janet Echelman that is the centerpiece of a new park in downtown Phoenix called The Civic Space Park. At the time, I only had my small point and shoot camera with me so the photo I published wasn’t as clear as it could be. In late June, I headed down to the park with my good camera and a tripod and took a few more photos in varying exposures. This one facing away from the tall buildings of downtown Phoenix was a favorite. I have photographed this wonderful piece in the daytime, but at night is when it truly shines. Click the link below to see how other city daily photo bloggers have portrayed the August theme of Night.